Please note, due to the size and nature of this item we are unable to dispatch with a courier. We can, therefore, offer this product on a collection basis from our Inverness store or to discuss delivery to a nearby location please contact us. 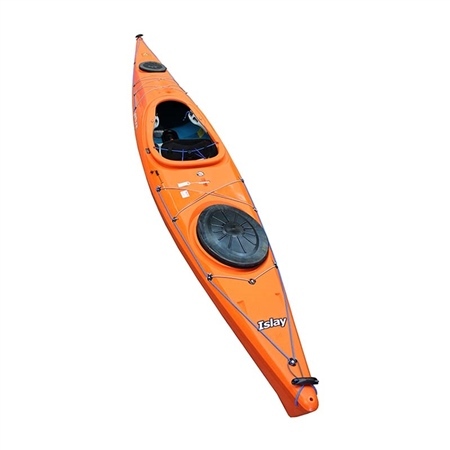 A longer kayak is a faster kayak, allowing you to cover larger distances; the Islay 14 is an adventure touring kayak with a length similar to that of a sea kayak, but in a format that offers a little more stability and manoeuvrability. Ideal for beginners and intermediates who want to try their hand at cosy weekend adventures and relaxed journeys of up to a week in length on canals, sheltered lakes, and gentle rivers. TriLite construction increases hull stiffness and reduces weight, enhancing the performance of our leading hull designs for a more responsive kayak. Medium to long distance journeys. Exploring lakes and gentle rivers with ease and the confidence to take photos from the kayak. The best combination of hull efficiency, speed, and a manageable size.